We took our first trip to Greece and the Greek Islands in late May and early June! We were so excited to visit this country and experience the culture! Naxos is located in between Mykonos and Santorini. It is pretty large in comparison to many of the other Cycladic islands. 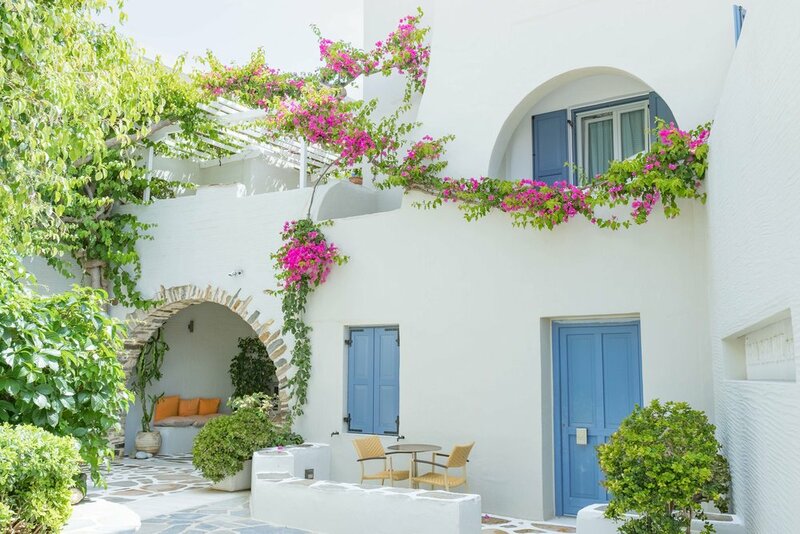 We chose Naxos because we wanted something a little more unique since we were already going to the popular island of Santorini! It was definitely very quiet on Naxos in late May. That's actually what I loved about it! We stayed in Agia Anna town, which has many restaurants and beach bars and a nice beach! 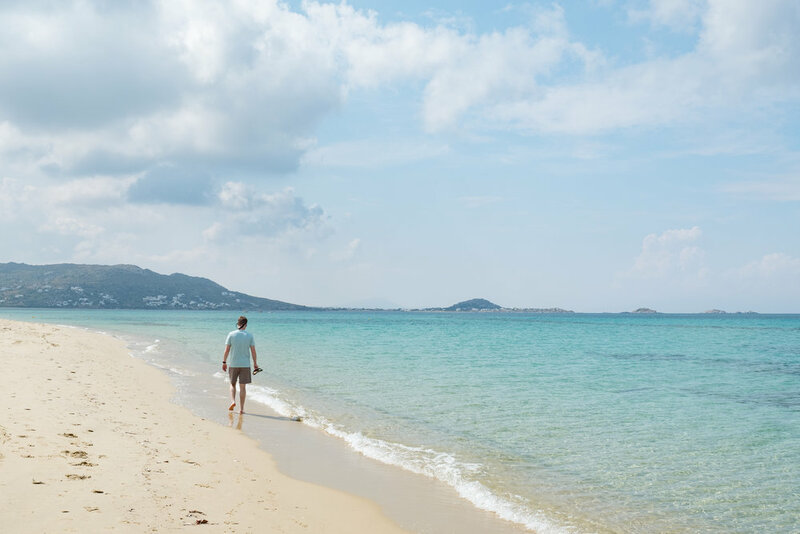 You're also pretty close to Plaka beach, which is arguably the best beach on the island! If you want a more lively area, I would recommend staying in Naxos Town. Later in the season, I bet Agia Anna would be the perfect place! It seems like there were several new, chic restaurants about to open for the season. Maybe trying to compete a little with the the trendy Mykonos scene. Iria Beach Art Hotel. This might have been my favorite things about visiting Naxos. The hotel was quaint and peaceful. A wonderful staff that made us feel right at home and we were steps from the beach! It almost felt like we were staying in an Airbnb with the conveniences of a hotel. Breakfast every morning included home made pastries, cakes and fresh squeezed orange juice! I can still taste the Orange Juice! Take me back! There are chairs and umbrellas located in front of the restaurants within 30 feet of the hotel. All you do is purchase a drink or light snack and the chair is yours. This early in the season we didn't have any trouble finding a chair! The food we had in Naxos was wonderful! Banana Beach Bar: Right in Agia Anna Beach, very cool, trendy vibe. Great food and perfect setting for watching the sunset! They share kitchens with the restaurant next door, so you can get things on their menu as well. I recommend the Zucchini balls! My favorite in Greece were at this place! Cedar Cafe: Plaka beach, Houmouli Salad and club sandwich, highly recommend. Gorgona Family Taverna: Agia Anna Beach. A more authentic Greek dining experience. We went here our first night and they kept bringing us more things to try and taste! It was so much fun! We left totally stuffed from all the delicious eats. Relax on the beach: Plaka Beach and Agia Anna Beach are great! 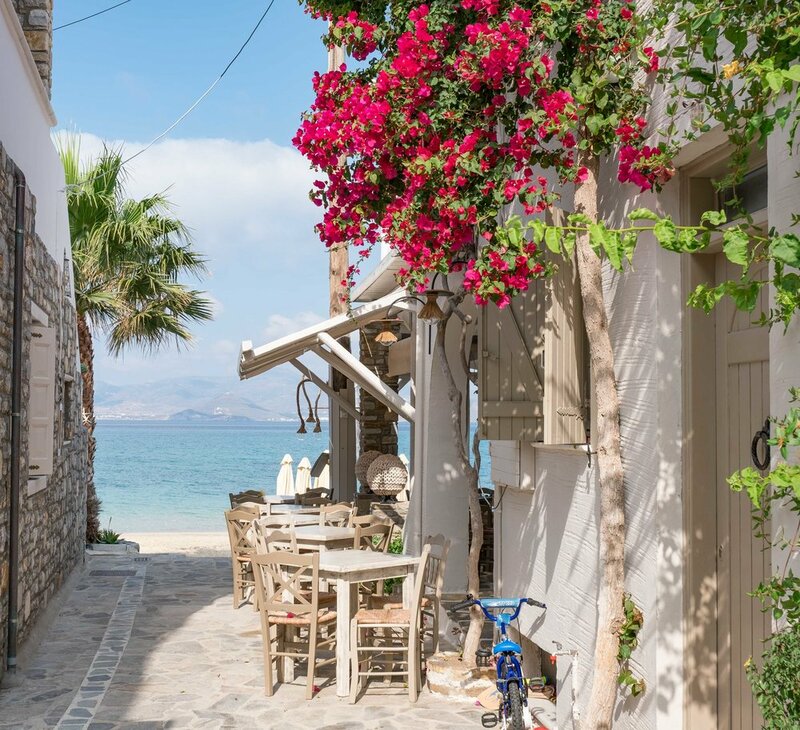 Stroll through Naxos town: Tons of great dining options for a light snack, lunch or gelato! Check out Pikantiko Grill House for a tasty gyro! You can do day trips to other islands if that's what you're looking for. 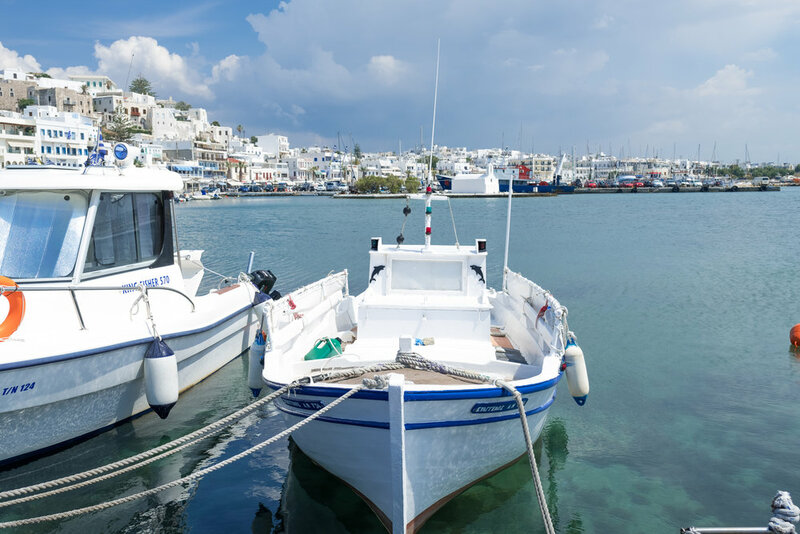 Paros is a short ferry ride away! Rent a motorbike and explore the island! If you want quiet and relaxed pace, late May is perfect! If you want a little busier go later in the season, mid June to end of August! I think we would have been ok with 2 nights, but I honestly felt like I relaxed so much here, I'm really glad we had 3 nights! I think my husband was a little antsy and ready move on, but I liked this place. The landscape is very flat, a lot different than Santorini! We loved the beaches and the crystal blue water. The laid back vibe is definitely our style, so I really enjoyed it here! If you are looking for something a little quieter, going in late May is recommended! I imagine it is much busier in July and August, but I think it'd be fun to be there when it's a little livelier! You can fly or take the ferry from Athens (or another island). It's about a 4.5-5 hour fairy ride from Athens or about a 30 minute flight. We chose to fly mainly because of the timing worked out better for us! 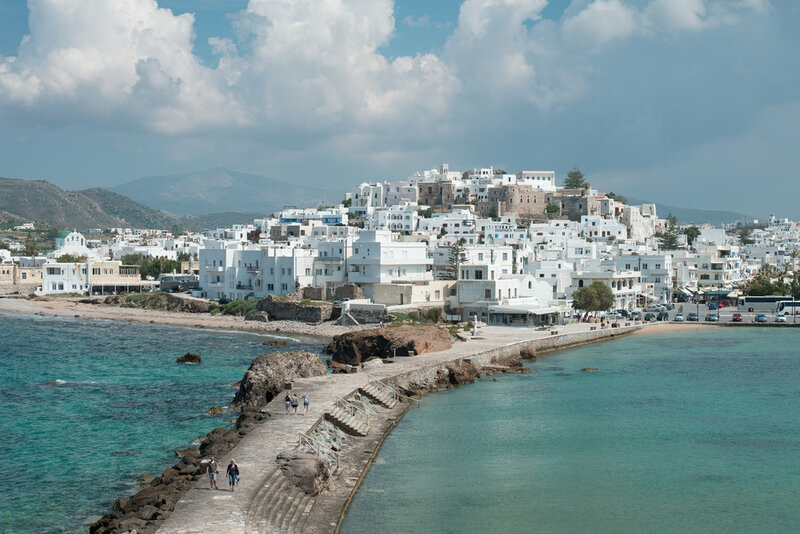 Maybe Naxos isn't the first Greek island that jumps to mind when you are planning your getaway, but I am so grateful we chose to visit this place! We had a wonderful time on an island that was much quieter and relaxed than other islands. It felt like we had room to breathe and get lost without hoards of tourists like you might experience on some of the more touristy islands! Are the Greek islands on your bucket list? Our first trip to Greece left me wanting more! I hope we have the chance to return someday!